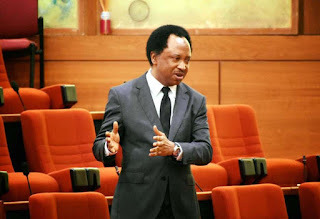 Shehu Sani, the senator representing Kaduna Central Senatorial District, on his verified Twitter handle has disagreed with the presidential candidate of the Peoples Democratic Party PDP, Atiku Abubakar, for promising to sell 90% of NNPC if elected president in 2019. The Senator described the promise as "a condemnable proposal and a dangerous intention." Recall that Atiku an interview with The African Report, had said that he will sell the Nigerian National Petroleum Corporation and retain just 10 per cent of the company for the Federal Government. He said that the NNPC was supposed to have become more profitable by now as Nigeria is in dire need of funds to develop its infrastructure and other sectors of the economy. 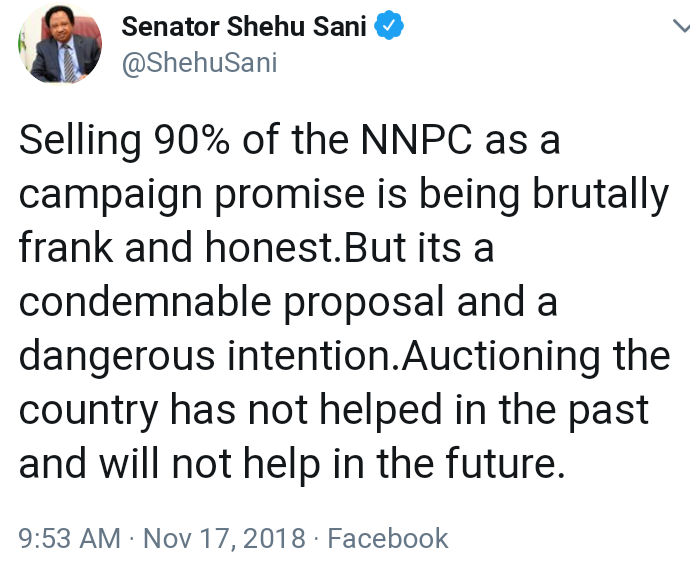 Reacting Sani said, "Selling 90% of the NNPC as a campaign promise is being brutally frank and honest.But its a condemnable proposal and a dangerous intention.Auctioning the country has not helped in the past and will not help in the future.